Christopher Bird graduated with his Ph.D from the University of Southampton in 2017 and worked within the Southampton University Marine Isotope Ecology Lab. His research was focussed on the trophic and spatial ecology of sharks both on regional and global scales. Having previously worked with both coastal and pelagic sharks at various locations around the globe, his PhD research concentrated on deep-sea habitats of the northeast Atlantic Ocean and used stable isotope analysis to unravel some mysteries of some of the worlds deepest living sharks. 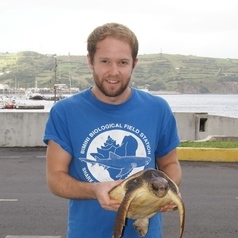 He now works for the Centre for Environmental, Fisheries and Aquaculture Science as a Fisheries Ecology.